Southwest of Texas’ capital city Austin and towards the Mexican border there is a large area of shale called the “Eagle Ford Shale”, EFS. For those interested I can mention that there is a good website “Eagle Ford Shale” where one can find all sorts of information on Eagle Ford. Figures in this report are from that website. A detailed study of Eagle Ford with prognoses on future production is one of the planned activities during my stay in Austin. Of course, there are many others doing similar analyses but it can be interesting to compare prognoses that have various starting assumptions. Maybe this can give an understanding of the limits for production. Eagle Ford is considered one of world’s largest oil- and gas-investments in terms of costs. During 2013 it is estimated that the volume of investment will be on the order of $30 billion. They calculate that all the investments in EFS have in 2012 generated over 116,000 jobs just in the provinces covering EFS geographically and many more jobs in peripheral areas. In purely economic terms the investments have meant twice as much for the region. The thing that distinguishes shale oil production is that it involves drilling of many wells that, in comparison with the traditional wells of conventional oilfields, give a relatively low production. To drill a well requires a drilling rig and there are weekly statistics available that show how many rigs are currently drilling. For 16 August 2013 it was reported that 267 rigs were drilling in Eagle Ford of which 241 drilled for oil. At the moment the price of natural gas is too low to make it profitable to drill new natural gas wells. They do drill for natural gas if it also provides quite a lot of condensate. Condensate has the same price as oil. In addition to the number of drilling rigs there are statistics on how long time it takes to drill a well and how long are the horizontal wells. If we choose statistics for the 5 most recently drilled wells over the last quarter then we see that it takes approximately half a month to drill a well and that it is approximately 2,430 metres long. During the last year they have drilled approximately 1000 wells per quarter (Q3 2012 – 1,024 wells, Q4 2012 – 974 wells, Q1 2013 – 1,044 wells, Q2 2013 – 1,050 wells) and it is obvious that production has increased. In May 2013 EFS reached production of 600,000 barrels per day. 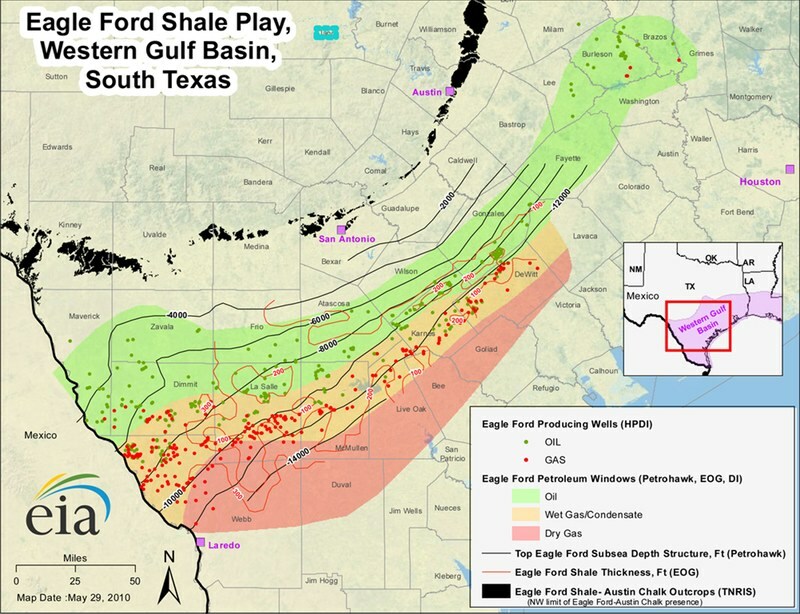 In April 2013 the USA produced 7.3 Mb/d and of this approximately 8% came from Eagle Ford. They estimate that Eagle Ford will exceed the production of the Bakken. Looking at all the wells being drilled in EFS and realizing that the production from the Bakken has begun to level off, this estimation would certainly appear to be correct. At the beginning of July there were approximately 4,000 oil wells and 1,700 gas wells in production in the EFS. Considering that they have drilled 4,000 wells in the last year you can understand that most of these wells must be quite new and so should have good production levels. Normally, a fracking well will lose more than 50% of its initial production rate in the first year. If 4,000 oil wells produce 600,000 barrels per day in total this means an average of 150 barrels per well per day. One company has reported that production when they initially pump in fracking fluids is 822 barrels per day which is less than they expected. The average production number of 150 barrels per day indicates therefore that production per well has declined very quickly. This will be interesting to investigate. In the figure above you can see that on 13 May permission had been given to drill 10,422 wells since 2008. Of these approximately 5,700 have been drilled. At the rate of drilling now prevailing this means that permits still exist for a little over one year of drilling. How rapidly can new permits be granted? The average cost for drilling a well has fallen from approximately $7 million to $6 million, but 4000 wells would thus still cost $24 billion. As long as the price of oil is high it is profitable to drill new wells but if the price falls, as it has done for natural gas, this may cause difficulties for the profitability of new projects. Those who think that fracking will give us cheap oil and natural gas must reconsider. There is an image of a local spot of EFS that shows how individual wells are drilled and one sees that there is no room for an unending number of them. The question is how many profitable wells can be drilled in future. There is a maximum limit and when we reach it, presumably sooner, then Eagle Ford will reach Peak Oil, i.e. the maximal rate of oil production. The question is whether the maximum will exceed 1 Mb/d. I am sure you can see that there are many interesting questions to study to understand the future of oil production in Eagle Ford.